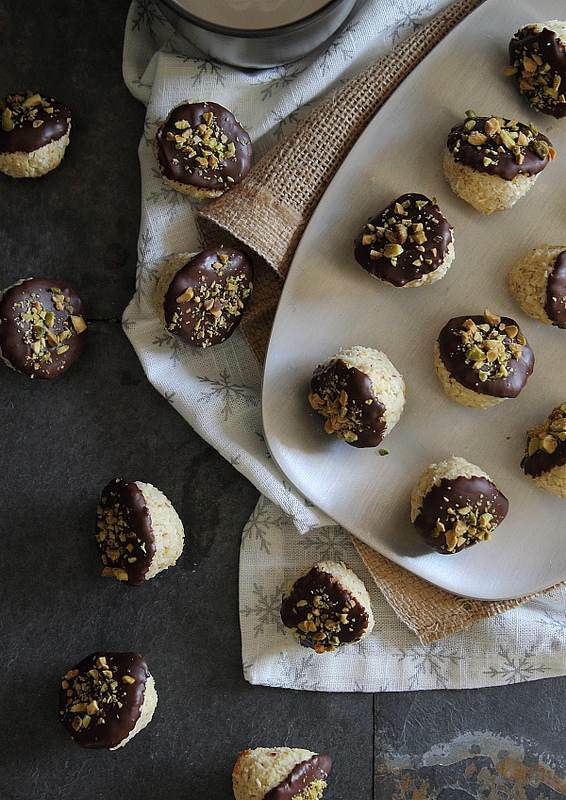 These chocolate dipped orange macaroons are the perfect little holiday treat! You guys…I’m just all over excited about this post. 2. Said cookies are actually paleo (which is totally accidental and I just realized as I was writing the ingredient list out below). 3. See that silver platter? I’ve been salvation army hunting for something like that for AGES. Finally found it this time around and it cost me a whopping $.99. Score. 4. I’m in love with how these little cuties photographed. 5. YOU get a chance to win a $500 Amazon gift card at the bottom of this post. (giveaway has ended) Wouldn’t that make holiday shopping a bit more fun?! Macaroons are one of my favorite cookies. They’re pretty much impossible to screw up (unlike their cousin the macaron) and they’re practically a health food; egg whites, coconut, dark chocolate…I mean those are some powerhouse ingredients right there. I also used maple syrup in these instead of sugar, a bit of almond flour to the coconut mix and the zest of an entire orange which gives them this awesome infused flavor. 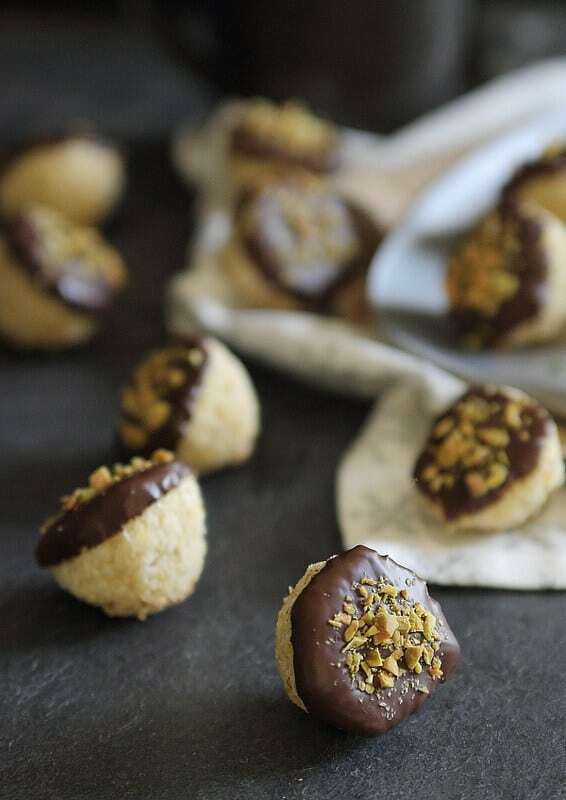 Oh, and then capped them off with a dark chocolate shell and chopped pistachios. So many of my favorite things all in one cute little acorn shaped package. If you’re not down with the orange/chocolate combo, just leave the chocolate dipping part out. Want to know why I dipped them? Ulysses hates chocolate. More for me. As I alluded to in a previous post, our house sale fell through at the last minute (the punk buying our house couldn’t get a mortgage because he lied to the bank on his preapproval-awesome right?) so here I was thinking all this holiday baking I had lined up for this month would be perfect because I’d be living at my parents house with 2 extra mouths to help eat it all and instead, I’m still in my (now half empty because we sold or already packed a lot of our furniture) house alone with all these sweets. When it comes to this recipe though, I can’t say I mind not having to share. Add egg whites to the bowl of stand mixer and beat with the whisk on high speed for about 2 minutes until fluffy. Add the maple syrup and continue beating for another 2 minutes. Remove the bowl from the stand and fold in the remaining ingredients with a spatula until the egg whites are completely incorporated. Heat the oven to 350 degrees and line a baking sheet with parchment or a silpat baking mat. Shape the dough into a cone/acorn shape in your palm using your fingers and place on the baking sheet. Bake for about 15 minutes just until the tops start to turn golden brown. Remove from the oven once this starts to happen. Let the macaroons cool completely. Melt the chocolate and oil in a small bowl. Once cooled, dip the flat end of the macaroons into the chocolate. Place them on a cooling rack with the tip pointing down. 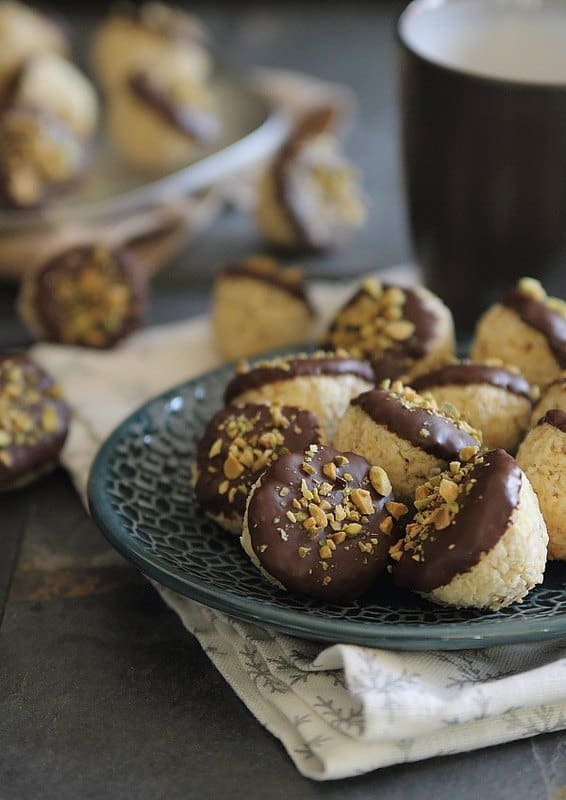 Sprinkle the pistachios on top of the chocolate coating and let them sit until hardened. Store in an air tight container in the refrigerator. 1) Don’t you just love thrifting! Especially when you get amazing dishes like that silver platter. 2) These are some of the most beautiful photos I have ever seen here Gina, and all yours are amazing! 3) I am so sorry about the house! And totally feel your pain on not having enough mouths to eat all this baking! 4) I want to eat all of these at once. Because they are little I can do that right? Thanks, Taylor :) And yes, thrifting is awesome! At least I think so. My husband thinks it’s gross. Especially when I came home with an awesome mug that had years of coffee stains on the inside. Nothing some white vinegar couldn’t take care of but he refuses to even touch it now, haha! Gina, these look divine! Like chocolate covered pillows. I will absolutely be adding these to my holiday baking line up! Chocolate and Pistachios? What could be better. To answer the question, I’d get a flash for my DSLR if I won! Wow – definitely adding this to my holiday baking. Everyone’s getting edibles this year. Sorry about the house – that’s the worst! My mother-in-law keeps telling me, as we’re in the same process, it wasn’t the right person/house/thing. Many things to say about this. First, This is so beautiful Gina. Really the light is amazing. And the composition. Sigh. Did you get a new lens? I am blown away! Pinning to my photography admiration board:) So glad to be doing this giveaway with you. Ulysses doesn’t like chocolate? And you married him? Ha ha. PS so bummed about the punk. Thanks, Katie! And yeah, I had no idea about the chocolate thing until after we were married. Not sure how I missed that one! I love coconut macaroons but have never attempted to make them before – will definitely give this a shot! Gina, I have relocated to NJ from the south. Where are all the good thrift stores in Jersey? Thanks!!! Hi Jenny- I live in NY, not NJ so I’m not sure, but I just hit up the Salvation Army or Goodwill stores around here. They’re chains that seem to be pretty prevalent. I’m comin’ over to help you eat them. These sound amazing! If I don’t have almond meal on hand, do you think I could substitute an extra 1/2 cup of coconut? I wish I could do the Facebook entries. Promosimple is having issues displaying the Like buttons so I can’t even see what the pages are. I recommend giveaway tools next time to the host – please pass it on! And I so want those macaroons. Sounds (and looks) delish. Thank you for the recipe. I would use the gift card to get Christmas gifts.